The copies of Wisdom of Solomon and Kings of Israel have arrived from China and have been shipped out to US Kickstarter backers! It has been a five month process since the Kickstarter campaign completed but things have gone quite smoothly overall. 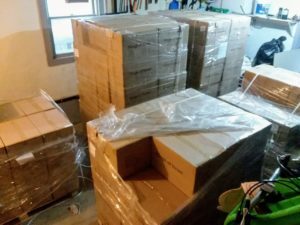 After they reached our location, somewhere between 200 and 250 boxes were assembled, loaded, and shipped out to everyone who preordered a copy of Wisdom of Solomon or Kings of Israel. The games going to Europe are still on the boat but should reach Germany on November 29th. In the meantime, now that copies are in hand of many more backers, we can start spreading the news directly!